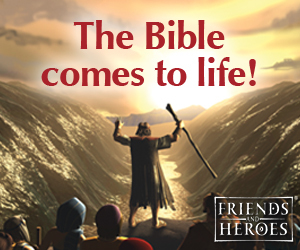 The ideas for this Bible lesson come from The Resource Room. You can find a complete lesson on The Resource Room. 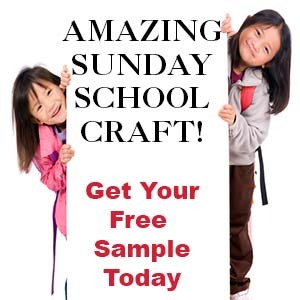 This lesson including all the crafts, games, and Bible verse cards for both younger and older children is available as an instant download (Everything on this page and more). 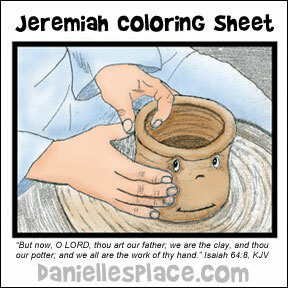 Teaching Concept: God is like a potter, he has complete control of our lives, and we are like the clay. God can choose to do what he wants with us. He warned the Israelites through Jeremiah that if they didn't stop the bad things they were doing, he would destroy them. Most of them didn't listen and they suffered the consequences. But God is merciful and a kind God, even though the people were evil and many of them suffered and died, God promised that one day he would forgive them rebuild their nation, and he did as he promised. Tell your children that potters make pottery using many different methods. They may use a potter's wheel, coils, or just pinch a lump of clay to make pottery. Show your children how to make a long snake-like shape with a piece of air drying clay and how to wind it up into a pot shape. Squish the side together so the coils stick together. You can find directions to make coil pots online. Instead of making coiled pots, you can have your children make pinch pots. These are easier to make and a little quicker. Use Crayola Model Magic Modeling (Affiliate Disclaimer) if you can. This clay dries very quickly and comes in different colors. It is very light weight and children can use magic markers to decorate them. If you don't have Model Magic, you can make your own clay. To make the dough place a 1-pound box of baking soda, one cup of cornstarch, and 1 1/4 cups of cold water in a saucepan. Cook over low heat until the dough looks like mashed potatoes. Remove from the heat. Cover it with a damp cloth until it cools and then store in a plastic bag. This dough gets very hard. It feels a little gritty so have some wet paper towel available for the children. For directions on how to make pinch pots go to this Web Site. As you children work ask them if their clay told them what kind of pots they wanted to be. Emphasize that the clay cannot decide what it wants to become, and if the pot doesn't come out the way they want, they can always press it back down into a lump and start all over. 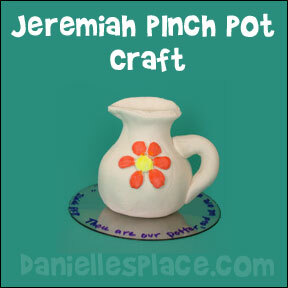 When a child has finished his pot have him write the Bible verse on a piece of paper and place it into the pot. "But now, O LORD, thou art our father; we are the clay, and thou our potter; and we all are the work of thy hand." Isaiah 64:8. If you have access to old CDs you can have your children place their pots on the CD's so that they look like they are on a potter's wheel. Have them write the verse or part of the verse around the outside edge of the CD. Before class print out the color sheet and make copies, above. In class have your children color the picture. As your children work ask them if they have ever seen a potter make pottery on a wheel. Also show them a video of a potter making a pot from Youtube if possible. Have all your children stand in a circle and then pick one child to be the clay. As you play music have the child who is in the middle of the circle pretend to be clay that is forming into a pot. The child should spin around and around and slowly change his or her shape. When the music tops the child should stop spinning. Whoever he is facing when he stops must say the memory verse and then take a turn standing in the circle pretending to be the clay. Bring in four or five clay pots, vases, cups, etc. (You can use only two if you would like, but you will have to mix them up on every turn.) Place candy or other prizes in some of the clay pots and cards that have the Bible verse written on them in other pots. Have your children take turns picking a pot. If the pot has a piece of candy in it, the child gets to keep the candy. If it has a Bible verse, the child should say the verse and wait for his or her next turn to pick another pot. Keep playing until all the children have a candy. When all the pots have been picked add more candy and verses and mix them up to start again. 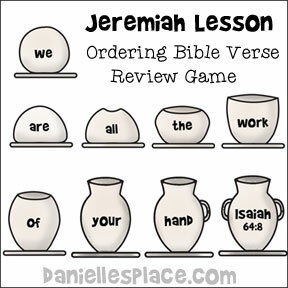 Teachers can use these pottery printouts to play different Bible verse review games with their students depending on the age of the children. 1. Younger Children - Write the words of the verse on the board and then go over the verse pointing out each word as you say the verse. Hide the pictures of the pottery stages in your class, Have your children look for the pictures. When a child finds a picture, he should place the picture under the matching word on the board. When all the pictures are in the correct place have your children say the verse again. 2. Older Children - Before class print out the pottery patterns and cut them apart, above. Make a set of pictures for every child or every couple of children. When the children arrive give them a set of pictures and have them place them in order to spell out the verse. 3. Older Children - Before class print out the pottery patterns and cut them apart, above. Place the pictures in a brown bag. In class mix up the pictures and have your children take turns reaching in the bag to select a picture. When a child picks out a picture, he should try to place the picture in order, and then say the verse. The child who can say the entire verse on his turn first wins. I am attending a new, small church in northeast Georgia. My pastor's wife and another person do the lessons and I have joined the ranks! Yesterday was my first encounter with the lesson and materials. Without having much time to 'plan' or read the lesson, etc.. I was able to easily go through and learn your way of doing things. I thought to myself.. this is so wonderful... this lady is either a teacher or a very creative mom.. and I was correct on both accounts! Molding me into a great woman or man! when I get all grown up hear me shout.
" I belong to God, there's no doubt!"